At StarFit Studio, we pride ourselves on offering a workout experience. Going to StarFit isn’t the same as going to your average gym, where you compete for space on the fitness floor or pay a fortune for a personal trainer. Instead, our women’s fitness studios in Arlington and Alexandria combine the best of boutique and traditional fitness. Take our exercise technology, for instance. Working out is like any other process in life — you want to use concrete data to inform your decisions and measure progress. 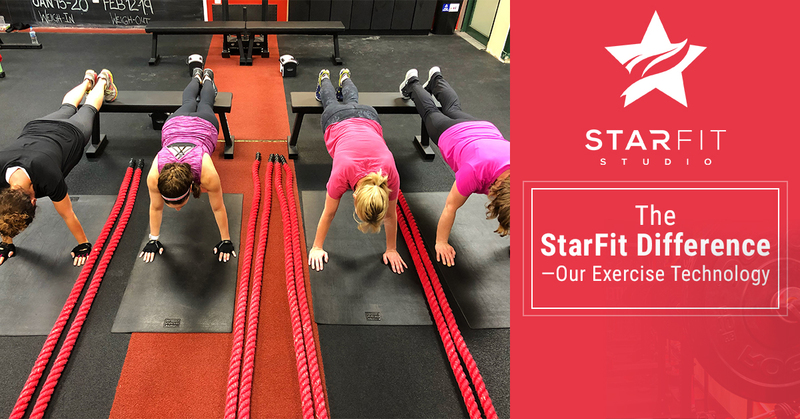 At StarFit, we’ve seen that having the right exercise technology encourages individuals to push themselves safely, feel successful, and measure progress. That’s why participants in our 60-minute sessions wear state-of-the-art exercise trackers. Being able to see these metrics not only motivates you, but also ensures that you’re pushing yourself during every workout. Working out with a group of like-minded, positive women also helps! If you’re in the red zone for too long, you know it’s okay to back off. If you’re heart rate is lower than your ideal range, it tells you to step it up and push yourself. After every workout, you don’t just leave with that intangible feeling of endorphins and workout euphoria — you leave with concrete stats proving just how hard you worked. Rather than need to keep a separate journal of your workout statistics, our women’s fitness studio takes care of the reflection for you. Indeed, we email you a detailed report of every workout you complete. It’s really incredible to look back at your first StarFit email and see the points you earned versus looking at more recent workouts — where you absolutely crush and rank first in your class. While we’re all about healthy competition, the last thing anyone wants in a women’s fitness studio is a cut-throat environment. That’s why each heart rate system is customized for you. There’s no “winning” heart rate or total calories burned statistic. In fact, what’s a great work out for one person might be dangerous for another. Instead of needing to worry about achieving an arbitrary goal, your fitness statistics are personalized for you. Everyone in class works as hard as they can — not as hard as the person next to them should. Northern Virginia is competitive enough as is. Join a women’s fitness studio where members support each other and have an incredible community — not where it’s all about image. StarFit Studio, with locations in Alexandria and Arlington, has three different membership options available. Plus, new participants can sign up for a free trial to see what StarFit is all about. Visit our women’s fitness studios today in Arlington and Alexandria!